Comments: Our client was a young woman whose ureter was injured during gynecologic surgery. This is all too common during abdominal and gynecologic surgeries for women. During the attempted corrective surgery by her doctor, the ureter was cut. This injury went untreated for 2 days resulting in severe abdominal pain. When the problem was finally diagnosed, the doctor attempted a second surgical repair. Unfortunately the doctor incorrectly attached the ureter to the wrong side of the bladder, causing the patient to suffer reflux, as well as chronic kidney infections. At trial, the doctor testified that he was aware that improper placement of the ureter could lead to such complications but he failed to inform the patient of this. Our experts were able to prove the clear malpractice and surgical errors by the doctor which caused our client harm. The Defendants appealed the Verdict twice, resulting in 3 trials over the course of 7 years. $6 Million was ultimately awarded to our client and an additional $3 Million was awarded to her husband for the change in their lives from her injuries. Some law firms would have given up after the first Appeal and encouraged their client to move on. 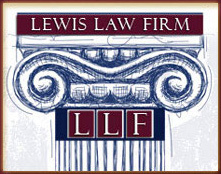 The Lewis Law Firm is different. Sometimes the fight takes longer than expected, but we stand committed throughout the process.